The recently hatched Vampyroteuthis (8 mm ML) looks very different in shape, color and general proportions from the paralarva or subadult. The latter two look quite similar except for the different fins present and the smaller size of the eyes in the paralarvae. The hatchling, however, differs in having short arms, no web, no dark pigment, no superficial gelatinous layer covering the head and mantle, no fusion of the head and mantle and a narrower gladius in the anterior half. A large amount of yolk can be seen internally through the transparent gladius. The filaments have a uniform diameter throughout, are short and thick, and arise in series with the eight normal arms. Figure. 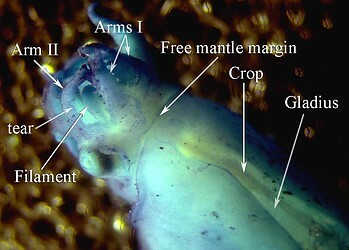 V. infernalis hatchling, 8 mm ML, captured off Hawaii, 1050-1300 m depth. Drawing modified from Young. and Vecchione, 1999. This photograph was made with transmitted light on the newly captured (i.e., unfixed) hatchling. The dark line is a pin placed on the hatchling to keep it from rolling, or floating while being photographed. Figure. Lateral view with slight dorsal tilt of V. infernalis, hatchling. Photograph with transmitted light modified from Young. and Vecchione, 1999. This photograph was made with reflected light on the preserved and stained (methylene blue) hatchling. The esophagus expands slightly forming a crop. An enlargement of this photograph can be found here. Figure. 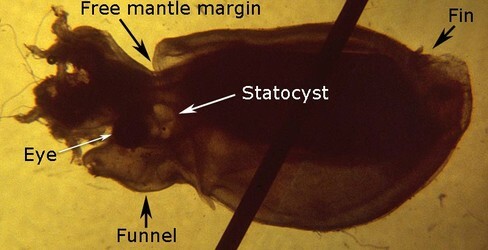 Reflected light photograph of the V. infernalis hatchling. Photograph modified from Young and Vecchione, 1999. Presumably the hatchlings drift in deep water until the yolk is utilized and they transform into the typical vampire-squid form. The size of the hatchling suggests that it came from an egg of nearly 8 mm in diameter. Pickford (1949) identified 4 mm eggs from plankton tows as belonging to Vampyroteuthis. This discrepancy cannot be explained at present. Pickford, G. E. 1949. Vampyroteuthis infernalis Chun, an archaic dibranchiate cephalopod. II. External anatomy. Dana-Report 32: 1-132. Young, R. E. and M. V. Vecchione. 1999. Morphological observations on a hatchling and a paralarva of the vampire squid, Vampyroteuthis infernalis Chun (Mollusca: Cephalopoda). Proc. Biol. Soc. Wash., 112(4): 661-666. Page: Tree of Life Vampyroteuthis Hatchling Authored by Richard E. Young and Michael Vecchione. The TEXT of this page is licensed under the Creative Commons Attribution-NonCommercial License - Version 3.0. Note that images and other media featured on this page are each governed by their own license, and they may or may not be available for reuse. Click on an image or a media link to access the media data window, which provides the relevant licensing information. For the general terms and conditions of ToL material reuse and redistribution, please see the Tree of Life Copyright Policies.